Cape Buffalo (also called African Buffalo) are notoriously dangerous animals. The fact that they are referred to as one of the "Big 5 Game" by hunters means that they have been ranked with African Elephants, Rhinoceros, Hippopotamus, and Lions as the world's most dangerous animals to hunt. Why is the Cape Buffalo so dangerous? When they are wounded or under attack, they become extremely aggressive and anyone who is within charging range of them is in serious jeopardy. What also makes them so dangerous is the fact that they are known to form a huge herd and attack their victims together. When they are not under direct threat, they can be found relaxing in the African Savannah where they are often seen sparring with other buffalo and eating. The kid-friendly information below highlights some key facts and information about this interesting African animal. Click here for a great selection of Amazon.com books about the Cape Buffalo. Cape Buffalo are fast runners. They can easily run up to 37 miles (59.5 kilometers) per hour. 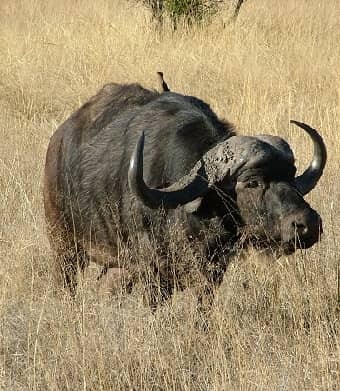 The buffalo have a symbiotic relationship with many African birds such as the Oxpecker. They are often found eating bothersome bugs off the buffalo and will also warn the buffalo when danger is near. Healthy Cape Buffalo can live between 15 and 25 years. In the wild these animals eat a diet of grass, herbs, leaves and other foliage. Cape Buffalo can be found throughout Sub-Sahara Africa in habitats ranging from savannahs to grasslands but they are never found far from a water source. The sick, old and young Cape Buffalo need to watch out for predators such as lions, crocodiles, hyenas, and leopards. The Cape Buffalo are very social animals and usually travel in herds of about a dozen, but have been known to travel in herds of up to 2,000 buffalo. The size of the Cape Buffalo does not stop them from swimming through bodies of water to reach a more suitable grazing location. They will also submerge themselves in the water to cool off from the hot sun. These mammals have a relatively long gestation period of eleven months (about 340 days) with mating season occurring mainly between the months of March and May. Cape Buffalo are hunted by humans for their thick hide but also simply for the sport of hunting and capturing such a potentially dangerous animal. The Cape Buffalo is an enormous animal, weighing in at up to 1750 pounds (793 kg). They are similar in weight to a full-grown horse. The hook-shaped horns of these animals, which can grow up to 63 inches (160 centimeters) long, are often used to defend themselves against predators and also to show dominance between the males in the herd. The hard shield in the middle of the male's horns is called the boss. It is not unusual for a male Cape Buffalo to reach 11 feet (2.1 - 3.4 meters) long and 5 feet (1.5 meters) tall. The Cape Buffalo's hide ranges in color from brownish black to bright red, depending on the species.